How do I recycle on campus? 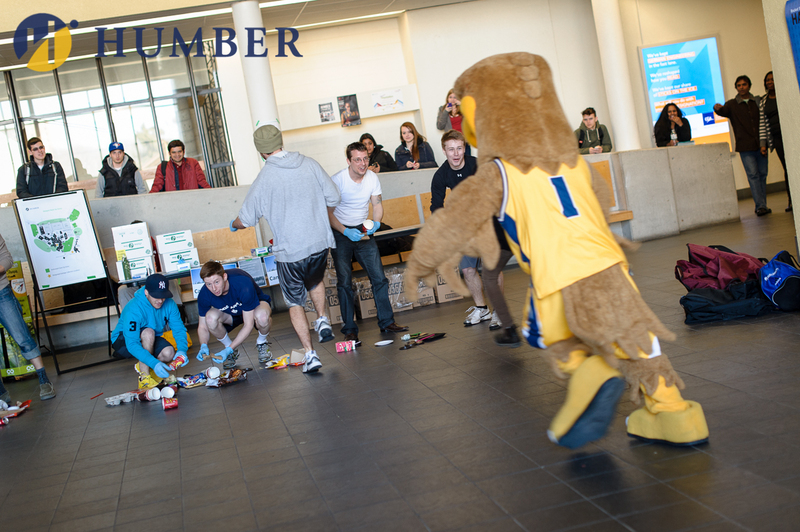 Humber is continuously working to reduce, reuse and recycle. In 2016, Humber diverted 63% of our waste from landfill. We have a goal to achieve 70% by 2019. The volume of waste generated by the campus population and Humber’s daily operations makes waste management an on-going priority. Fortunately, the waste produced in a college environment is well suited to management and recovery, as most of it is clean (non-hazardous) and can be easily separated for recycling. Humber is constantly expanding its waste management program and has introduced holistic solutions to reduce waste production and encourage reuse, recycling and composting on campus. These changes have generated measurable efficiencies in Humber’s operations. Staff and students have helped create innovative programs to educate the Humber community about how to recycle on campus. Find out more about the college's waste diversion programs. A waste audit is a study of the waste generated over a typical 24 hour period at the college. It involves measuring the quantity of waste generated, and identifying its composition identifying the manner by which the waste is produced. Humber conducts a waste audit on an annual basis in order to understand our waste streams and to improve the management of our waste. This information also helps us identify ways to reduce overall waste generation and improve our diversion rate. Ontario Regulation 102/94 under the Environmental Protection Act 1990 requires us to conduct an annual waste audit and develop and implement plans to reduce, reuse and recycle. Below are Humber's most recent audit reports and waste reduction plans. Bring reusable containers, plates, and forks for lunches and snacks on-campus. Use china in Residence and for meetings. Bring your own reusable coffee mug to receive a discount on campus. Bring your own water bottle and fill up at one of our water refill stations. Scrape any leftover food in the green bins and then recycle the containers. Pour any liquid into a nearby drain or sink before recycling your cup/bottle.